Dark Horse comics lost the Star Wars licence when their contract ran out and Disney bought Lucasfilm. Disney owns Marvel Comics so the galaxy far far away returned to where Star Wars comics began a long ago. Marvel Comics releases a few new series of Star Wars in 2015 and I start reading the main “Star Wars”. Good writing capturing the voice of the characters and good art from Cassaday. Not up to his level in Planetary but okay for a licenced property (I’m looking at you Star Trek). But lord why would they place this between Episode 4 A New Hope and Episode 5 Empire Strikes Back? We know no one is going to die no matter what happens for 40 years since the original cast is back for Episode 8 The Force Awakens. Luke crashes the Emperors co-ed beach party in only a speedo? Guess what he’s going to make it out alive riding Palatine’s surf board. Han Solo Bleeding out in some alien wasteland with no chance of rescue? That nerf herder will pull through and have a quip for Chewbacca. For 40 years! Then the actual comic logistics. Are we going to have 20 to 40 issues before we are treated to a movie adaptation of Empire and then another 20-40 issues till the same for Return of the Jedi? I had really hoped that this series would have picked up after the Yuuzhan Vong stories in the novels but I probably could have been happy with after Return of the Jedi. And the bantha in the room, Marvel already covered this era of Star Wars the last time they had the licence in the 70’s and 80’s, I know because I read them the first time around and this time there’s no kitschy 70’s since artwork. I think Marvel and Disney missed an opportunity to move the story forward and decided to make a few bucks playing on our childhood nostalgia. So I think I’ll be removing Star Wars from my pull list with issue 12 as the lastest issue (#6) has failed to change my mind with a blinded non Jedi Luke escaping Boba Fett. Surprise, surprise. I really thought Luke was going to bite it. When Telus Mobility called me this week to see how everything is going, which is quite well by the way… I told them I was happy with the actual cell service but still enraged about how their new two year plans are punitive and insulting. I just cannot believe that more people don’t realize this or have not taken to the streets in a Montreal Canadians Stanley Cup win riot in rage. Lets put this in context. When I got my iPhone 4 I got for $55 1GB of data, weeknights and weekends free and 10 numbers on a special call list that would not go against my minutes. Three years later and a month or two before the iPhone 5S was released I noticed they were offering a $60 for 3GB of data and unlimited calling nation wide. The nice representative gave me the new plan without adding time onto my almost expired 3 year contact as I told them I would be getting the new iPhone ASAP when it was released. That was until I saw the new plans. The new plans are a) not only worse than what was offered not just a month before but three years before and b) more expensive. So what happened? Cell phone company greed. It’s not just Telus, all of the carriers in Canada have lowered the bar to to similarly awful plans across the board. They are punishing the consumer because the Canadian government told them to ditch three year contracts. Do not sheed tears for them, they will still get their pound of flesh. A subsidized iPhone now requires a minimum plan of $70 versus the $55 from 2010 or $60 a month earlier in 2013. Also for $70 now you get 500mb. 2010 it was 1GB and my current plan is 3GB. That’s 6 times less data! Data still cost the same for the carriers before and after the iPhone’s release. Data is 1’s and 0’s, electrical signals, a virtual commodity. They are not grown, harvested and shipped to market. There is no shortage or crop failure that causes market scarcity and prices to rise. I have told Telus that when whatever the next iPhone is I will but it from Apple unlocked. The very nice representative said I could buy the phone from Telus unlocked. I told her that I would rather give Apple the money than Telus on principal. It would cheaper from me to but the phone unlocked than pay more and get less just to receive the subsidy on the phone. Finally I can use a SIM card in the USA on my phone! You See Them Too, Right? Over on iPhone in Canada go read their story on what I knew was true What’s Cheaper? Buying an Unlocked iPhone vs Subsidized 2-Year Term Compared. Nice to see someone actually did the math so I have some actual facts to back-up my anger. Oh and PS, if you want to new iPhone please for god’s sake wait till the fall for the new one. At the very least you could get the iPhone 5S as the free one. First off I am not a prequel guy. Whether it be Stars Wars or any other franchise. I’m looking at you The Flintstones In Viva Rock Vegas! I want new stories that push a collective universe forward not filling in that 3 month period when Yoda was between grades five and six at the Jedi Academy 800 years ago. No thanks. With Dark Horse’s Star Wars Legacy (Volume 1) I enjoyed this extended universe set 130 years ABY (that’s after the battle of Yavin for you non Star Wars geeks). Cade Skywalker was a flawed descendant of Luke Skywalker that continually walked the line between the light and dark side of the force. That made for some great stories. They had a good run ending it at Issue 50 and one mini series. Most importantly, it pushed the Star Wars universe forward. Volume 2 of Legacy (click here to read a preview of issue 6) follows Ania Solo, descendant of Han and Leia. Initially I was really excited about this title as Volume 1 was pretty good. Unfortunately I don’t see Ania Solo being the standout character that Cade Skywalker was in volume one. Could be just early days, her character needing to be fleshed out. Might be Ania being the reluctant hero versus Cade the over the top daredevil Jedi / space pirate. I have a different idea. Writers Corinna Bechko & Gabriel Hardman needed to introduce Ania Solo with a few issues thereby building her up, rooting her in the Legacy universe. Instead the series is already at light speed and hip deep with inherited characters from volume 1. These characters over shadow Ania and don’t give her a chance to come the forefront. For example, in the first six issues Ania has only been on the cover three times and one of those was from behind. On top of all that the art is simply okay. It’s adequate to tell the story but beyond that it personally doesn’t wow me. At times it can be very flat and washed out and due to the sketchy nature of the art, detail can be lacking. The big event in Star Wars comics this year for me is The Star Wars. Based on George Lucas’s original rough-draft screenplay form 1974 and Ralph Mcquarrie concept artwork (which I loved as a child). For fans it’s interesting to see where Star Wars originally started and contrast that to the final films we know so well. Issue one (of eight) introduces us to strange but familiar characters like General Skywalker, Annikin Starkiller and a much less disfigured Darth Vader and Emperor. The art by Mike Mayhew and colours by Rain Beredo are beyond excellent giving it a very detailed and painted look. See for yourself in this seven page preview. Unlike Legacy it visually looks like a film with the posing and layout. You can tell this is a prestige project for Dark Horse with the quality of the art and even the cover is of a glossy thicker paper stock. Unlike a prequel this story is different enough to stand on it’s own merits and opens up a new universe for our imagination, pushing things forward. 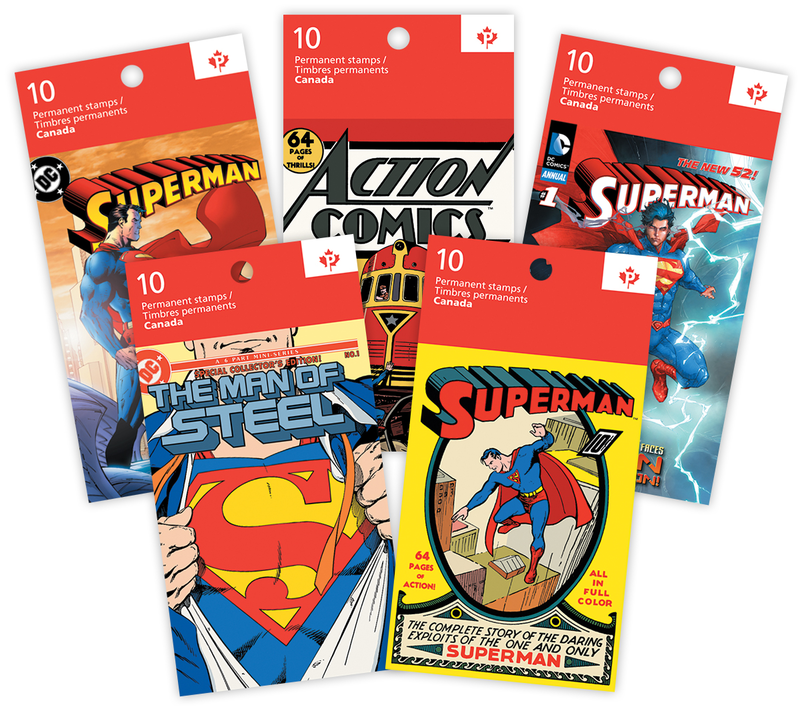 Up up and away collectors, both the Canadian Royal Mint and Canada Post are celebrating the 75th Anniversary of Superman with releases. Canada Post has everything from permanent stamp coils, booklets, postcards, official first day cover and a very nice uncut press sheet. For the real comic book fans that need to know… they feature art from 1939: Superman #1 (artist: Joe Shuster), 1945: Superman #32 (artist: Wayne Boring), 1971: Superman #233, (artist: Neal Adams), 1986: Man of Steel #1 (artist: John Byrne), 2004: Superman #204, (artist: Jim Lee) and 2012: Superman Annual #1 (artist Kenneth Rocafort). The Royal Canadian Mint has released seven coins ranging in price from $29.75 for the 50 cent Then and Now coin and stamp set to $750.00 for the 75$ 14k gold Early Years coin. You can guess which one I would be leaning towards getting personally. 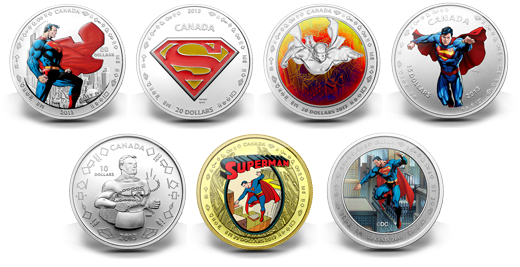 In what I am sure is a first in Canada (or anywhere), each coin has “SUPERMAN” in the Kryptonian language in both English and French. So does that make the coins tri-lingual, even if one of the languages is fictitious? If you are wondering why these two Crown corporations are celebrating an American icon, Superman co-creator Joe Shuster was born in Toronto (where he worked at the Toronto Star) before moving to the United States as a teenager. 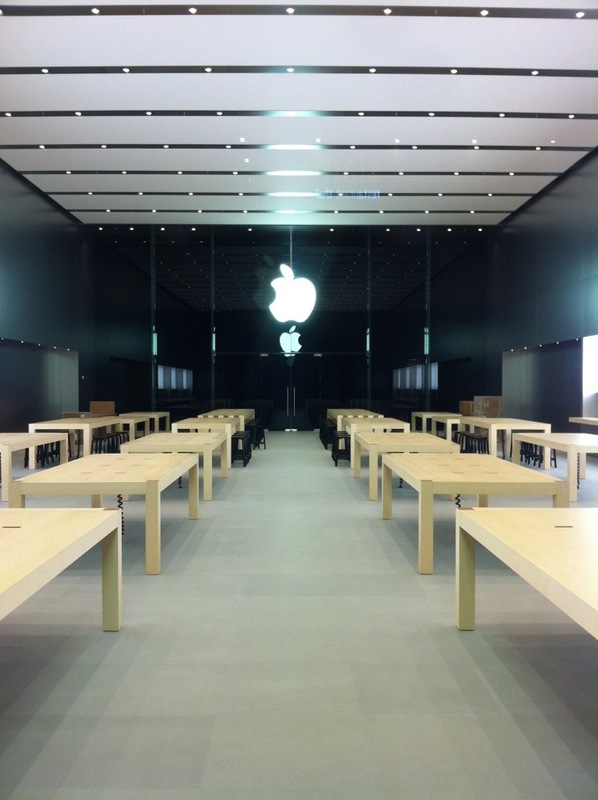 Tables sans product are set up and ready for the new Apple store opening April 27th in Brossard’s Dix30 mega shopping area. Located in the new Square Dix30 subdivision, the Apple store is a 450 meter walk from the Micro Boutique store that solely carries Apple products. Micro Boutique must be worried with Apple opening a store in the same area when people can go to the real Apple store. While there is both a Future Shop and Best Buy located near by, neither of these big box stores rely on Apple products for their bottom line. Either way this is a good thing for south shore Apple users as we no longer have to travel downtown to see an Apple genius. 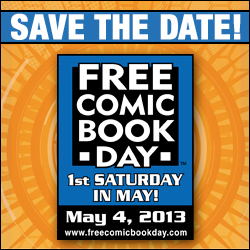 Free Comic Book Day is May 4th. 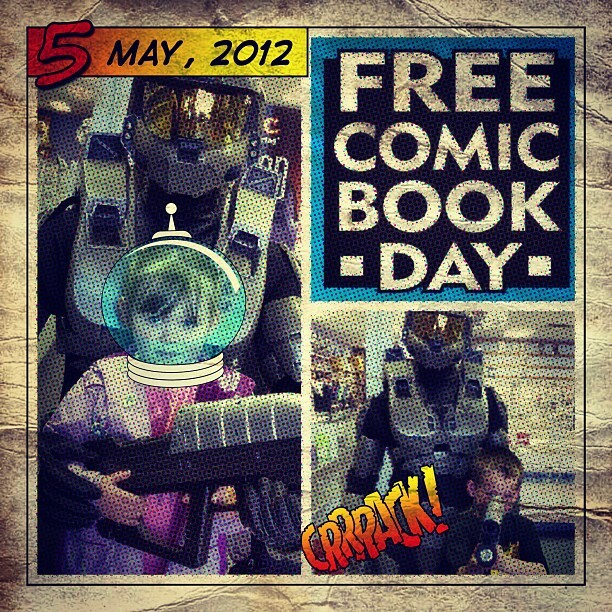 Grab the kids and head to your local comic book store to score free comics for the kids (and yourself). Unsure where the local comic book shop is? Use the store locator. I used to bring the kids every time I pick-up my comics but I think it oversaturated them to the medium. They have little to no interest in comics. Unless it’s a $20 Sonic import manga. Kids today! Why if my father wanted to take me to buy comics I would have been ecstatic. Actually he did but he was more driver / bank account than willing participant. For us full time comic readers, FCBD is an excellent opportunity to try out a new title with no risk. I have started collecting a few series after getting a free issue at FCBD. There are quite a few choices for even the little kids like Sponge Bob, Sesame Street, The Smurfs and Tinker Bell (I wonder which my daughter will pick?…. Tinker Bell) to name just a few. Check out the full list of available comics for this year. Selection and quantity will vary. Remember, it’s the local shop and not the comic publishers that purchased these issues for us fans so don’t be greedy. The kids (who did want to come with dad) had fun last year when there was a Master Chief in store and they posted with him. 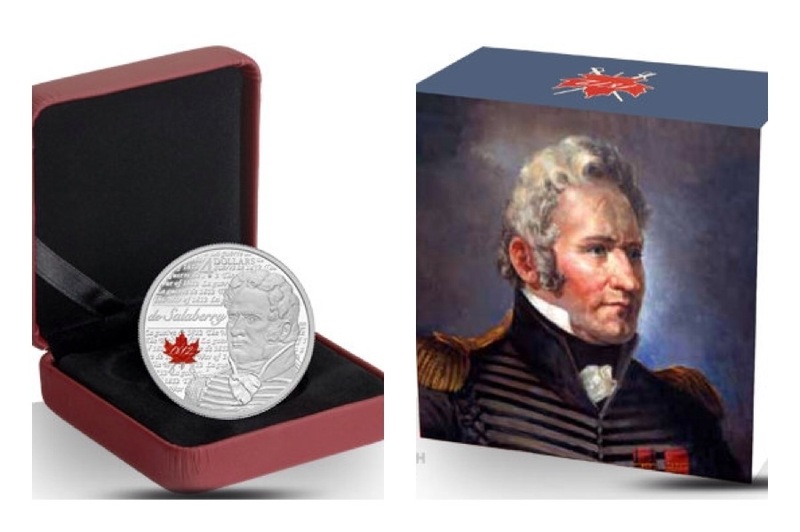 The Royal Canadian Mint has released their third coin the War of 1812 series, Charles-Michel de Salaberry. 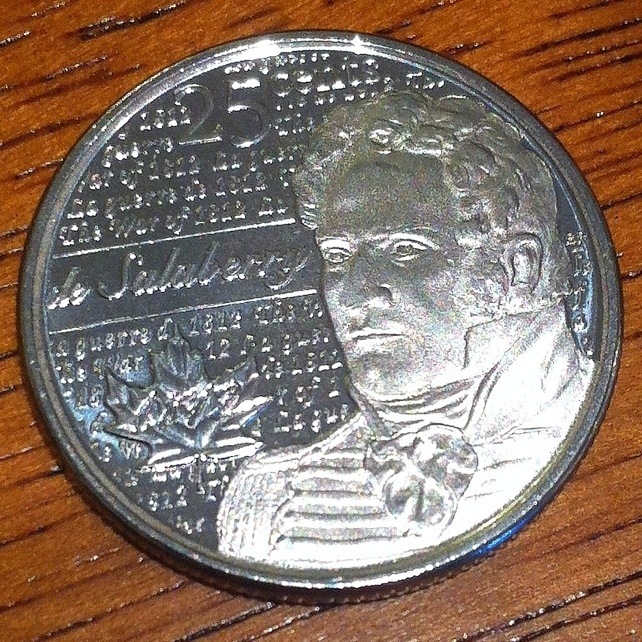 According to Wikipedia, de Salaberry defeated a superior American force advance on Montreal in 1813 at Chateauguay. Kind of a big deal. That’s also why we had the city of Salaberry-de-Valleyfield. The $49.95 fine silver (99.99% pure) de Salaberry quarter is available for purchase now from the mint for those of you with more money than cents (that was a pun). While the 10 coin pack is only available for purchase April 9th from their web site I was lucky enough to get two of the non-painted version from my father in-law. Next quarter in the 1812 series, Laura Secord. 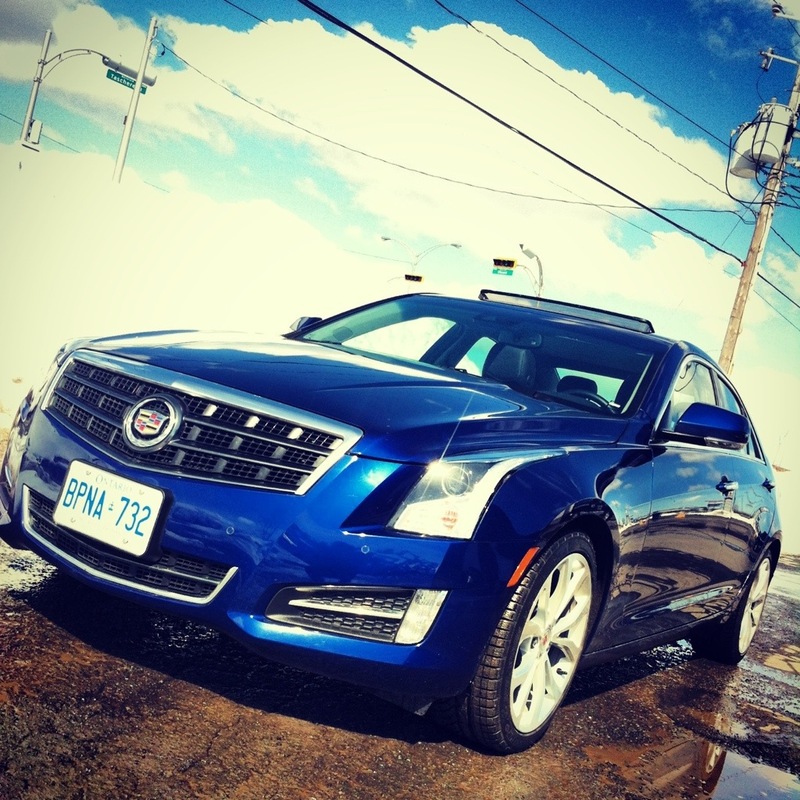 Thanks to Klout, I got a chance to test drive the 2013 Cadillac ATS for a few days. First impressions, the exterior has some great lines and has that Cadillac look that is consistent across their multiple lines of vehicles. Interior, some nice seats up front but not a lot of back seat room for passages. While it has seat belts for three you would be hard pressed to find any adults that could stand it for long trips. The kids were very cramped. 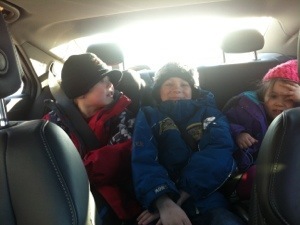 The kids were a little cramped in the back seat. The model I received seemed to be fully loaded with everything you would expect from a luxury vehicle. Some of my favorite were the heated seats, the backup camera and exit assist that moves the seat away from the steering wheel when you park. The exterior lighting on door handles and below the driver and front passenger doors was really nice. 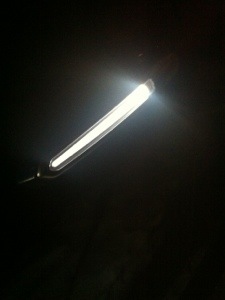 Lights in the handles, just call me Tron. I did like the haptic feed back of the touch controls on the console. Cadillac does need to look at a recent cell phone to see what people expect from a touch device. Nice console. But lots of finger prints. My almost three year old phone has better resolution and is more responsive than the ATS’s touch screen. Animations between menus took longer than they should. The last thing you want to be when changing lanes is waiting for an animation to cycle. 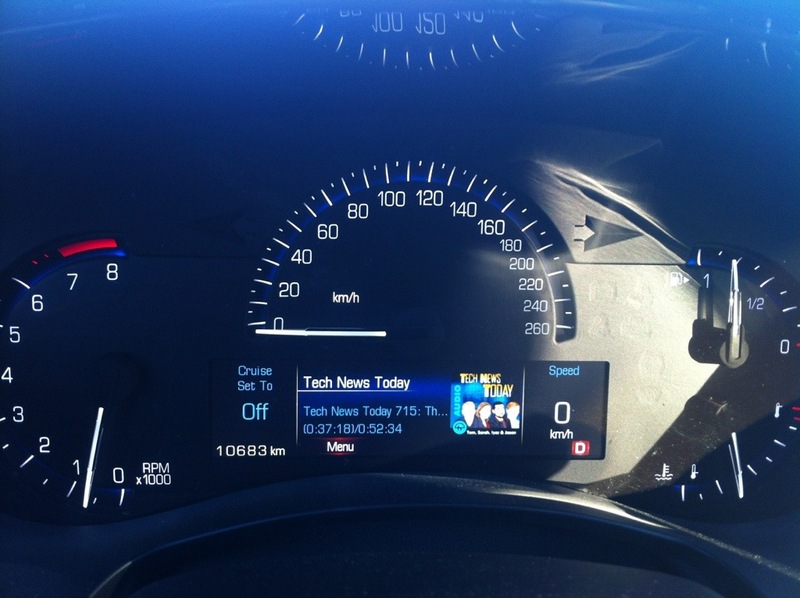 Now the ATS does come with voice control that would solve lots of the issues with physically going to the console. I had pretty good results for the most part. 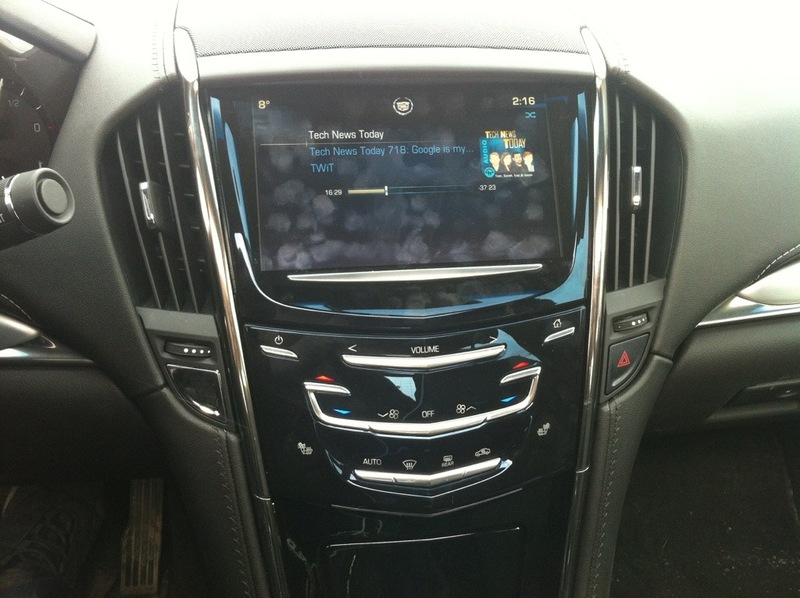 I could play podcasts and music off my iPhone an really liked that album art both on the console and on the dash. Listening to Tech News Today from the TWIT network. The calls I placed over bluetooth were loud and clear in the cabin. Needless to say the ATS was a serious upgrade from the family minivan and wish I could have had it I bit longer. Well that’s it, after 158 years the Canadian Mint is pulling the plug on the penny. Cash transactions will now be rounded to either .00 or .05. For example .01, .02, .06 and .07 will round down and .03, .04, .08 & .09 will round up. The Canadian Mint has a good FAQ on the procedure with pictures. Electronic transactions will not be affected. For those of you feeling nostalgic for our poor friend the penny or simply coin collectors, the Canadian Mint released a special wrap roll of the 2012 1 cent coins. I love the historical significance of it but last time I checked that should be 50 cents not $9.95 CAD a roll. Check out the info-graphic of the history of the penny entitled the Life and Times of the Canadian Penny on their site. Even Google has gotten in on things with a Google doddle for our poor penny. The funny thing is that 2013 is visible as the year on the penny and the Canadian Mint did not mint any with that year. Looks like Google has taken some artistic license with their doodle. 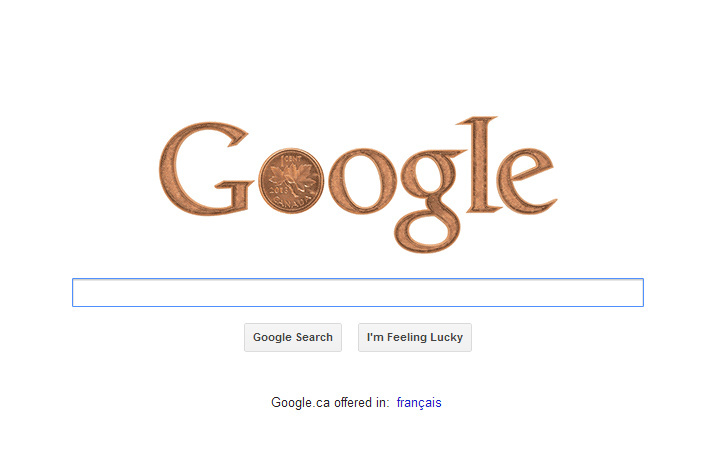 Google doddle tribute to the last day of the penny. Hold on to that lucky penny you find on the street, it has now become a rarity and doubly lucky.